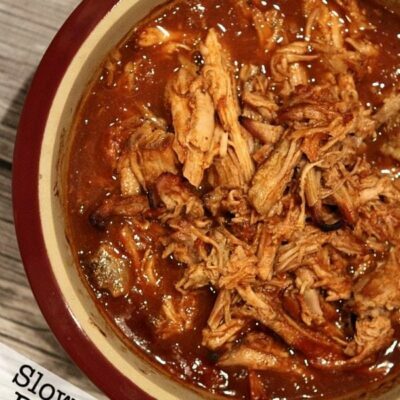 This Slow Cooked Swiss Pork is an easy recipe to make in your slow cooker for tonight’s dinner! 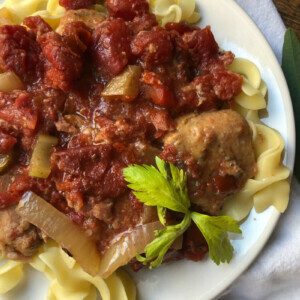 Marinated pork is slow cooked with onion, celery and tomato to create a delicious, tender, pull apart pork and sauce to top egg noodles. 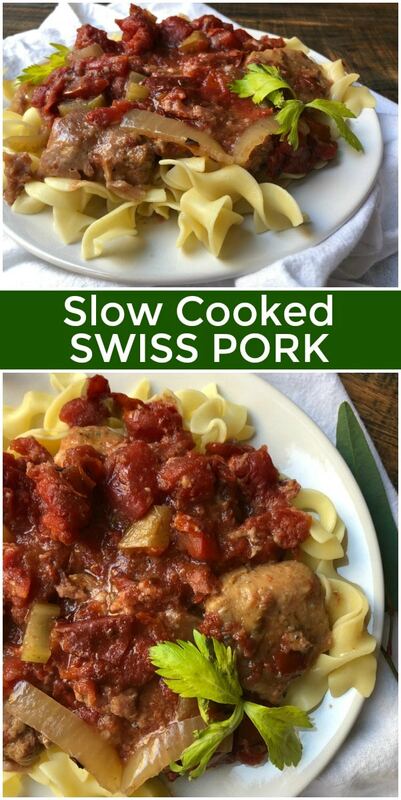 I’ve created a lot of pork recipes using Smithfield‘s already marinated fresh pork, but this Slow Cooked Swiss Pork has turned out to be one of my all-time favorites. 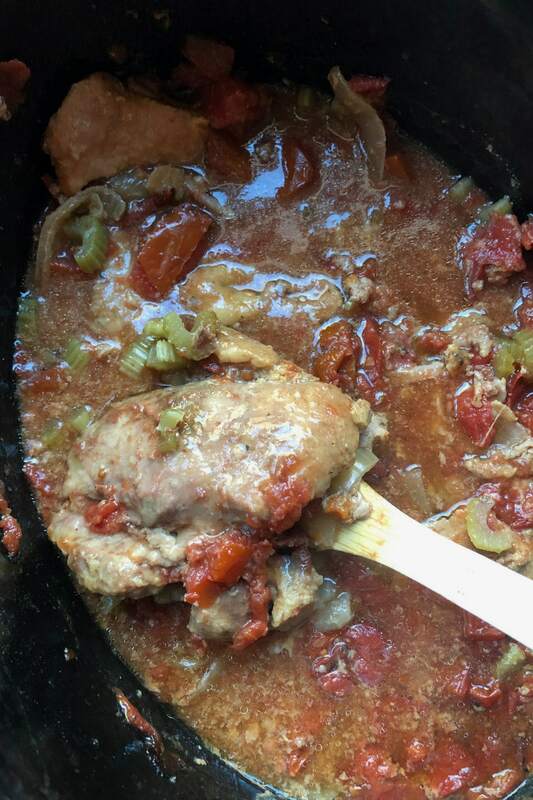 I took one of my favorite recipes (Slow Cooked Swiss Beef), and re-worked the recipe to use pork instead of beef. I wasn’t sure how it would turn out, but it turned out to be incredible! 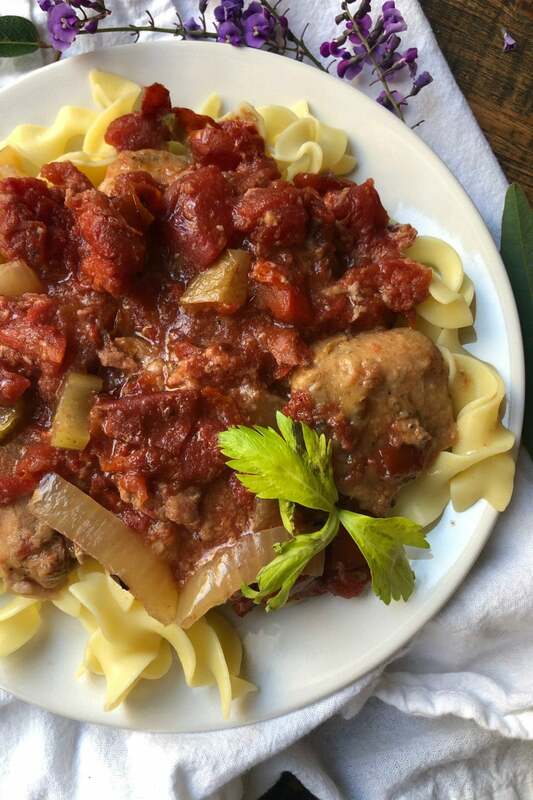 The tender, slow cooked pork is pure comfort food dished over hot cooked egg noodles with a couple of spoonfuls of tomato sauce. This meal is a new favorite in my house! Smithfield is currently having a “Shake it Up” recipe contest, helping at-home cooks reimagine mealtime and get creative in the kitchen. 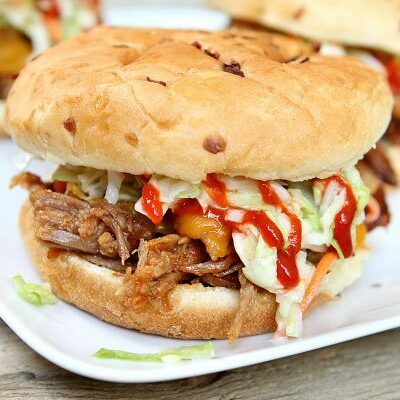 From now through April 26, visit Smithfield.com/ShakeItUp to submit a photo of your original dish along with a brief description of how you shake up your go-to recipes with Smithfield Fresh Pork instead of beef or chicken. Twenty finalists will win a $100 gift card, and one grand prize winner will take home $5,000. This is my fourth year working with Smithfield Pork, creating recipes using their already marinated cuts of fresh pork (roasts, filets, ribs, sirloins and tenderloins). I love these products because they’re so easy to use to make a hassle-free meal that takes less than 30 minutes prep time. Smithfield’s already marinated fresh pork products are pre-seasoned and versatile– they work well in the slow cooker, grilled, roasted or sauteed. 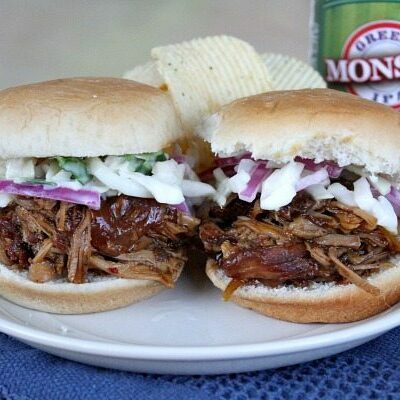 These are made from 100% fresh pork with no artificial ingredients and packed with protein. It couldn’t be any easier! Just put sliced onions in the bottom of your slow cooker insert. Dip sliced pork roast into flour to coat, and place the pork on top of the onions. Top it all with canned fire roasted tomatoes, celery and a little bit of Worcestershire sauce, put the lid on and cook for 6 hours! You’ll end up with the most tender pork roast ever, and it will be accompanied by a wonderful sauce. I love that the pork is already marinated and perfectly seasoned. That means I didn’t have to add a lot of extra ingredients to flavor this dish! 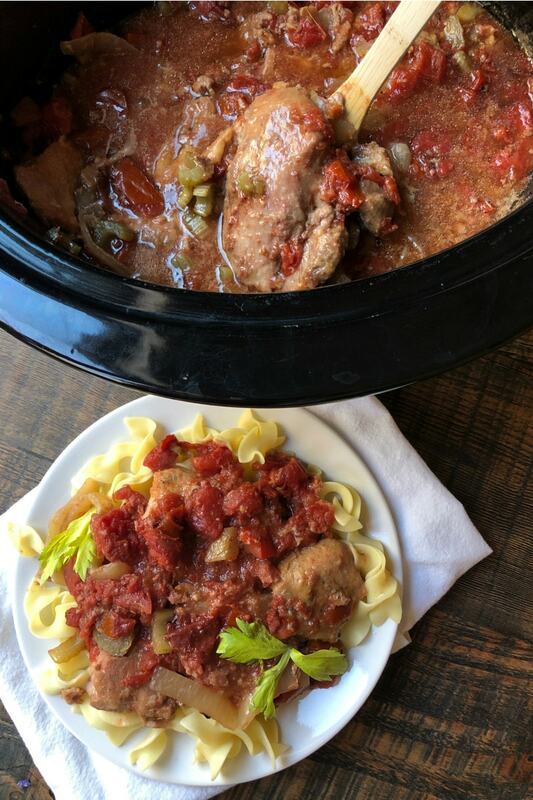 My family enjoys this Slow Cooked Swiss Pork served over egg noodles. You could certainly serve it over rice too. And it would be amazing served alongside mashed potatoes. 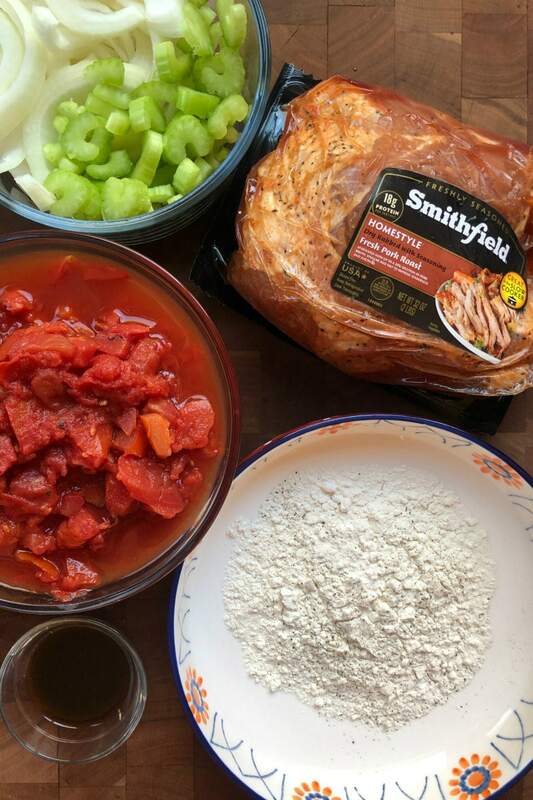 You can find Smithfield’s marinated fresh pork at select grocery stores across the US, including ShopRite, Food Lion, Publix, Albertsons/Safeway, Save a Lot and Walmart. The pork is available in an assortment of flavors such as Roasted Garlic & Herb, Applewood Smoked Bacon, Sweet Teriyaki and Slow Smoked Mesquite. For more product information and recipe inspiration, visit www.Smithfield.com. And don’t forget to check out the “Shake it Up” contest at Smithfield.com/ShakeItUp (where you’ll find all of the contest rules). Here's a super simple dinner recipe using already marinated pork roast, and it's SO GOOD! Place the flour, salt and pepper in a shallow bowl, and stir to combine. Slice the pork roast into about 6 pieces (discard any large pieces of fat). Put the onion in the bottom of your slow cooker insert. Dip the pork roast slices into the flour, coating both sides, and place on top of the onion. 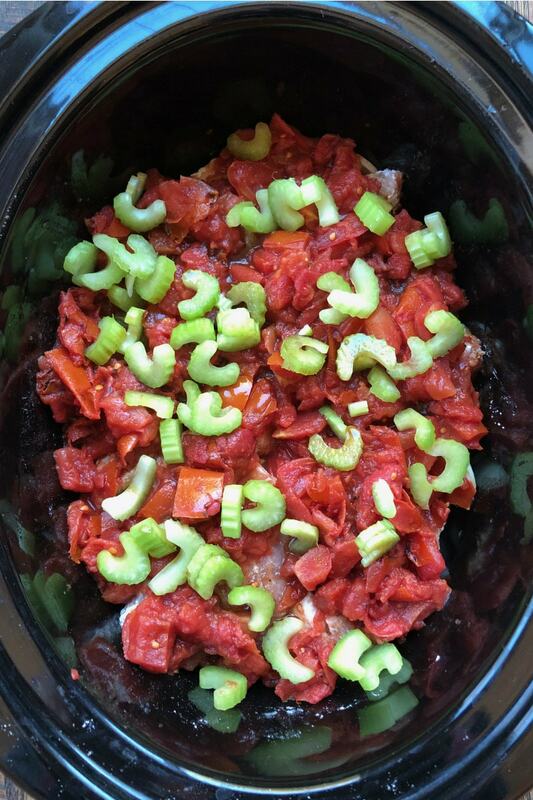 Top with the tomatoes, celery, and Worcestershire sauce. Cover and cook on low for 6 hours. 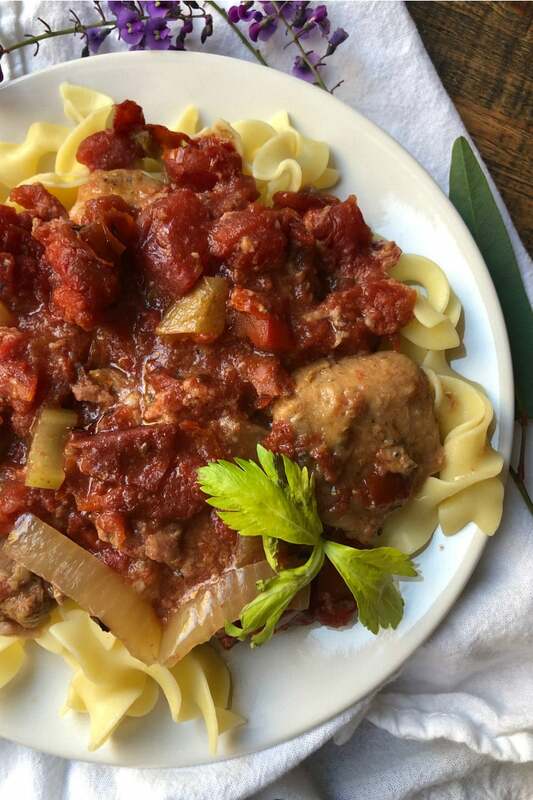 Serve the pork over the egg noodles with a little bit of the tomato-onion mixture. Garnish with fresh parsley or celery leaves. Nutritional information includes pork and sauce only-- count noodles or rice separately. Adding this to my weekend plans! Love Smithfield pork! This recipe looks amazing, can’t wait to try it! This is such a great recipe! I can’t wait to make this again! I really loved it! Such an amazing meal! My family loved it! Thank you for this delicious recipe! It looks so tender.